I’m excited to say that all of the card graphics have been designed now! The last two card types are the Mini-Summary and Round cards. The Mini-summary card is a brief overview of the game for each player. On one side it outlines the round, each of the four phases and the crucial steps in each phase to remind you of the round order. The other side of the card has a scoring summary to help you keep your eye on the prize and all of the ways of scoring bonus points in the final scoring. The Round cards are used to set up each round of game play. There are two types, the Early Round and Late Round card. In a 2 player game 5 of each are used to make a 10 round game. In a 3 or 4 player game 4 of each are used to make an 8 round game. Each Round card tells you three things. The number of Low and High Profile Missions available, the Event which can apply to some or all players, and the cost to buy Prospects during the Street phase. The Event includes a Challenge which targeted players must overcome, and a Penalty they must pay if they fail! 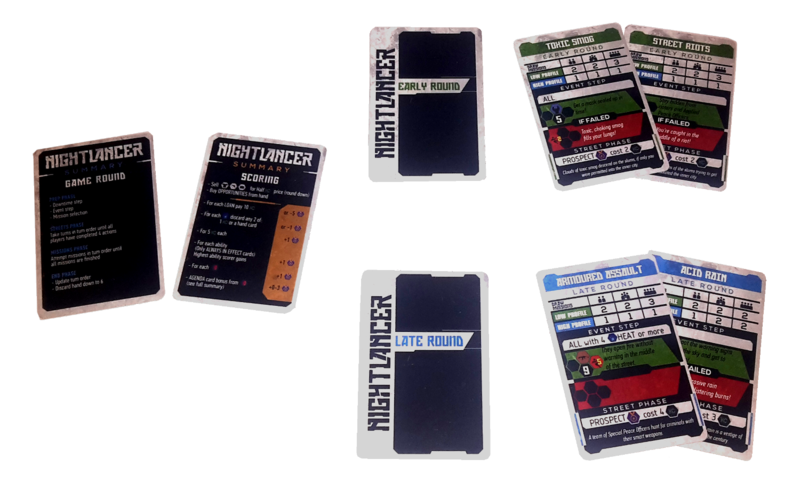 There are 16 Round cards included in Nightlancer, 8 of each type. This means that each time you play there will be a different order and combination of Round cards to challenge you anew.